A few clouds. Low 49F. Winds light and variable.. This photo included in the Mine Safety and Health Administration investigation report shows the aftermath of an October 2017 accident at the Marigold Mine. 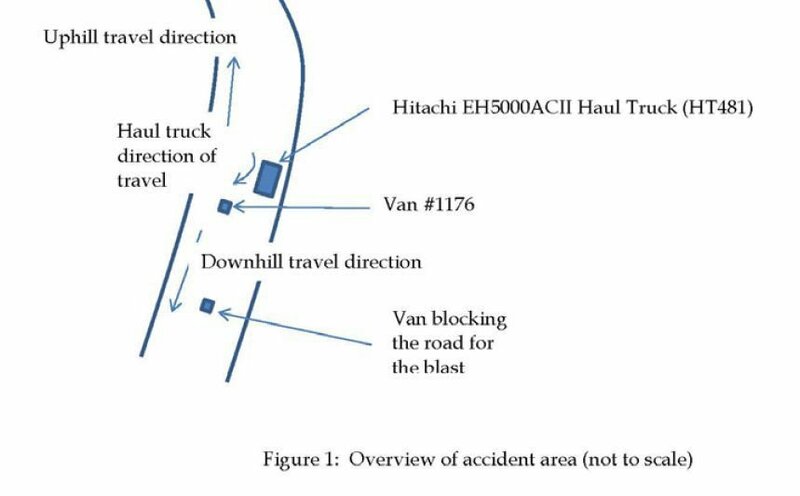 A screenshot from the Mine Safety and Health Administration's report of investigation on the Oct. 31, 2017, fatal accident at the Marigold Mine in Valmy shows the position of a passenger van parked in the blind spot of a haul truck. Two people were killed when the haul truck crushed the cab of the passenger van. Unenforced policies, lack of communication and ineffective traffic rules resulted in last year’s double-fatality accident at SSR Mining Inc.’s Marigold Mine, according to an investigations report from the Mine Safety and Health Administration. A loaded 340-ton haul truck struck a passenger van during a fatal powered haulage accident just after 2 p.m. Oct. 31, 2017, at the surface gold mine near Valmy. Two mine employees — safety superintendent Pete Kuhn, who was driving the van, and equipment operator Omar Bernal, who was riding in the front passenger seat of the van — were killed in the accident. One of the seven other passengers was treated for a leg injury while the remaining passengers and haul truck driver were assessed and treated for shock. The passengers were new employees taking an introductory mine tour, according to the report. MSHA’s root cause analysis states that the van operator did not make radio contact with the mobile equipment operator and parked in the haul truck’s blind spot on the right side toward the front. The van was a 2012 Ford E-350, and the haul truck was a 2009 Hitachi dump truck. The haul truck was carrying a load of 342.8 tons at the time of the accident, MSHA reports. The report indicates that the van operator was allowed to pass a barricade into a congested area while traffic was suspended for a blast and a safety check of another piece of equipment. 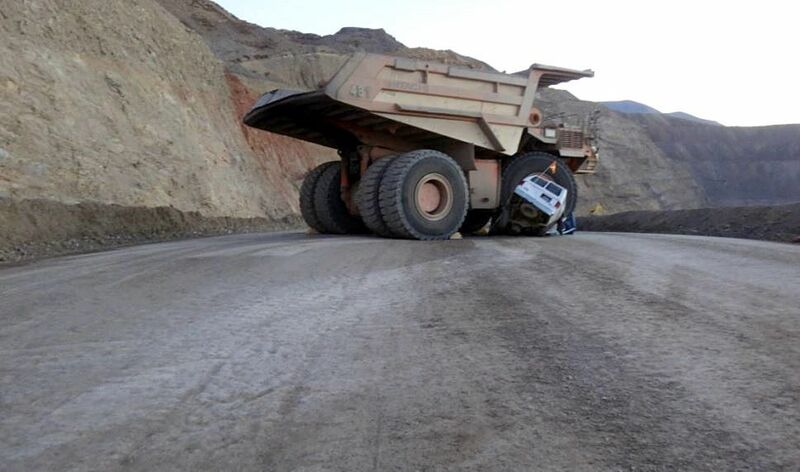 When traffic resumed, the haul truck operator took a right turn, crushing the cab of the van, according to the report. The passengers riding on the bench seats behind the front seats were able to escape through the side door or window, the report states. The company updated its policies and procedures, and developed new training materials, adding information about blind spot awareness and communication. Using the updated policies, procedures and training material, the operator retrained the workforce, MSHA reports. MSHA issued the company a citation for a violation of the Code of Regulations regarding traffic control. Penalty assessments consider factors including history of previous violations, size of the business, any negligence by the operator, gravity of the violation, and the operator’s good faith in trying to correct the violation promptly, according to MSHA’s website. The penalty amount was not included in the MSHA investigation report. The company also was cited under a different event number for missing the MSHA experienced miner training record for Kuhn, the report states; Bernal’s training records were in compliance. Kuhn, 60, had more than 25 years in the mining industry including more than one year as safety superintendent at the Marigold Mine. Bernal, 39, had 16 weeks of experience as an equipment operator as a temporary employee at the mine, and Oct. 31 was his first day as a Marigold employee. "SLAM RISK Safety Every Job - Every Day - Every Time" subliminal order still working!